The Keto Mac Griddle breakfast sandwich is my healthy keto version of Mickey D’s Sausage McGriddles. In my view, it is spot on for the savory, maple pancake and sausage treat. If you are a McGriddles fan, you know exactly what I mean. So how did I come upon this stroke of genius I call the Keto Mac Griddle? It all started with my Keto Breakfast Biscuits. While developing the recipe I noticed how similar the taste and texture was to the McGriddle after putting Keto Buttery Maple Syrup on them. I knew I was on to something. So, I did a little more experimenting with the maple syrup and voila; perfection. It wasn’t a big stretch to add my homemade breakfast sausage to the breakfast biscuits and as a result, a star was born. Of course, some people will go ahead and ruin a perfectly good Keto Mac Griddle Sandwich by adding an egg. But to each his own, I always say. If you want to add an egg or even a piece of cheese, who am I to judge. This is a perfect recipe for meal prep. Each component can be made ahead and put together on the run. The Keto buttery maple syrup can be made well in advance. I fact, I make up a batch quite regularly. It’s great in my morning coffee or on my keto instant noatmeal. Similarly, make the Keto Breakfast sausage and pre-cook the patties. Then, freeze for later use. When your ready to make your breakfast sandwiches, simply take the sausage out of the freezer and place in the refrigerator the night before. The Keto breakfast biscuits can also be made ahead of time and frozen. Hopefully, your will power is better than mine, the biscuits are so good they rarely make it to my freezer. Keto Breakfast Sausage – Feel free to use any sugar free breakfast sausage. 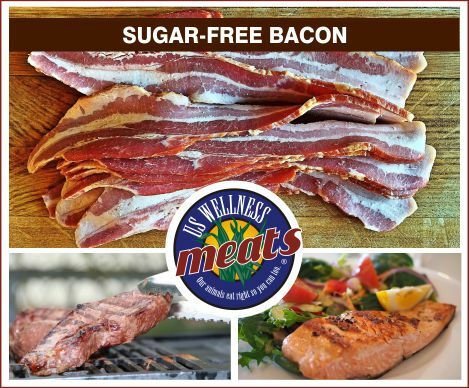 I recommend US Wellness Meats if you don’t want to make your own. Cut the keto breakfast biscuits in half. Add 1 pre-cooked sausage patty. Top with 1 tbsp keto buttery maple syrup. Microwave each keto Mac Griddle for 1 minute. Prep time stated is for making the Keto Breakfast Biscuits, Keto Buttery Maple Syrup, and cooking the sausage patties. Cook time for the Mac Griddle is only 1 minute in the microwave. Having the right keto pantry items ahead of time makes life so much easier when preparing recipes. Who looks forward to dropping everything you are doing right in the middle of preparing a recipe to run to the store. Furthermore, last minute shopping can break the budget. I have been guilty of paying much more for a product when I don’t plan ahead. So today I have a couple of recommendations. First, be prepared by shopping for your essential pantry items ahead of time. Second, shop online for some of the best Keto friendly prices.